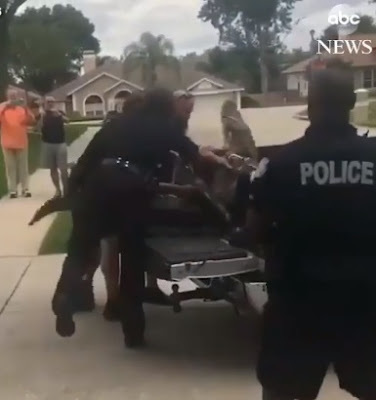 In an online video, officers are seen lifting the bound crocodile and placing it in the back of a van. But while trying to throw the animal in the trunk, he used the upper part of his body to knock down a sturdy officer from the Florida Wildlife and Fish Conservancy. An official woman tries to keep him in place to keep him from attacking the male officer, but the crocodile hits her with his tail, sending her flying backwards. The alligator then tries to escape, but was eventually captured and dragged into the truck with a rope while continuing to fight.